Octigrahica’s Time Flow is yet another clock utility app to come to the iTunes store. It’s like most apps of its kind (Clock, Atomic Clock, etc.) in that it does not do much else aside from tell the time. 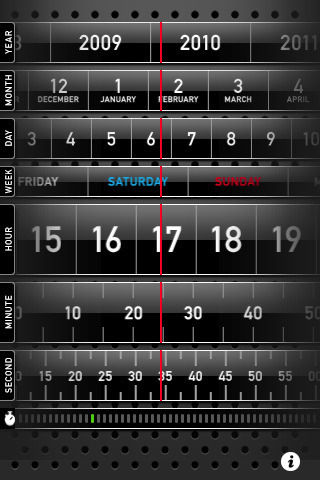 The app shows the current time with different horizontally moving bars for the year, month, day, day of the week, hour, minute, second, and fraction of a second. You can choose which bars you want to display. Disabling different bars also makes more room for the world map feature (if you select it) with you guessed it: shows your current location with a red dot on a map of the world. You can also play with the app’s appearance by changing the background image and the bar spacing color. The background image comes in solid black or punch metal. The bar spacing color also comes in metal or none (which is just simple lines). There is also a sleepless mode. The app takes advantage of the iPhone’s accelerometer and allows you to shake your phone to make the bars move horizontally. Why? I do not know. This feature is like a cliche: you might use it at first, but then the novelty wears off quickly. You can also make the horizontal bars move by flicking the bar or swiping it with your finger. The bar will move for a little while, and then it will stop. Overall, the app has decent physics. Timeflow also looks pretty slick for a clock. All that gun metal and the sans-serif font creates a minimalist aesthetic. This contrasts with the detailed background that reminds me of rubber wristbands on sporty watches. Maybe I’m just too practical, but I don’t see the need for all this excess. This app just tries too hard, but doesn’t accomplish very much. The map feature for instance is ridiculous. Why would anyone need a feature that tells them what country they’re located on the map? Isn’t that something they teach you in grade school? Developers should install an alarm clock or something useful to make the $0.99 tag worthwhile. If I wanted to know the time, I could look just look at the default clock on the iPhone. Time Flow tries to be a fancier clock and fails miserably on the important things: it doesn’t have an alarm and it offers poor ease of reading. Why get a fancier clock if you can just use the one you already have? There’s no need to waste $0.99 on something this frivolous. AppSafari review of Time Flow was written by Linda Ta on March 29th, 2010 and categorized under App Store, Maps, Reference, Utilities. Page viewed 3685 times, 1 so far today. Need help on using these apps? Please read the Help Page.